At times you may want to 301 domain redirect traffic from one domain to another and this can be done at both the domain level and for specific web pages. For example, domain.com and its web traffic can be redirected to anotherdomain.com OR domain.com/aboutus.html can be redirected to anotherdomain.com/about.html. 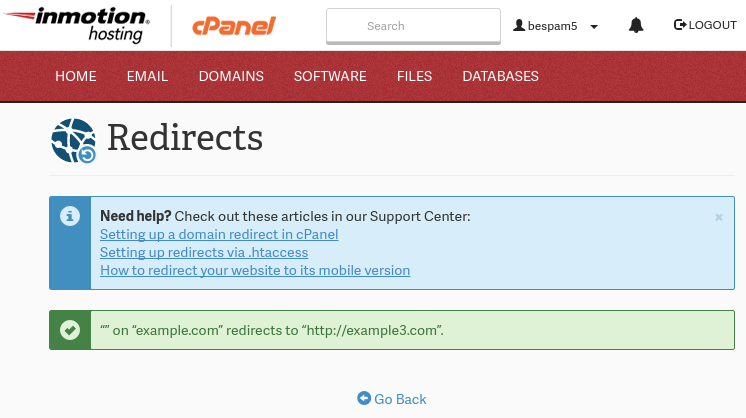 In this guide we show you how to create a redirect in your cPanel which automatically adds a redirect rule to your .htaccess file. You will then be on the Add Redirect page. Click the drop-down box for Type and choose either a Permanent (301) or Temporary (302) redirect. For the slash '/' field, enter any folder names (if necessary). Enter the address you want to redirect to in the Redirects to section. Choose if you want to "Only redirect with www." "Redirect with or without www." or "Do Not Redirect www." 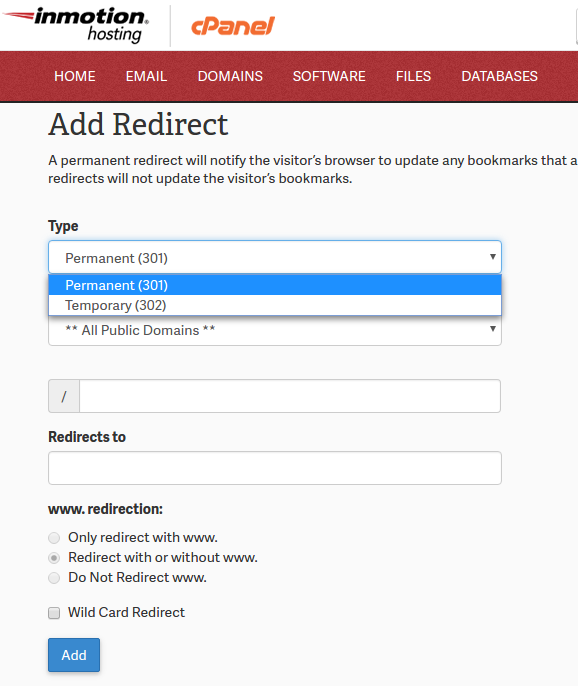 Check the box if you want to create a Wild Card Redirect. This will add the the file/folder name after the url when it redirects. For instance, example.com/test.php would redirect to example2.com/test.php. 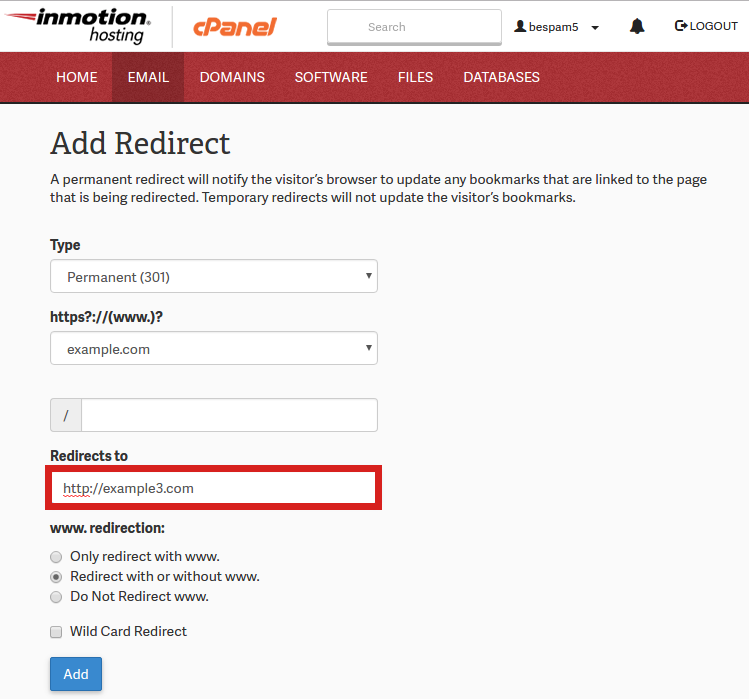 Congratulations, now you know how to create a redirect in your cPanel! Did you know? You can also create a 301 redirect directly in your .htaccess file. I've set up the 301 redirect in Cpanel and it works fine for direct links to the main domain. However, I am still able to see other pages or folders (About Page, etc) when I try navigating to them. I thought this should not be possible if the "/" was left blank...? I'm having difficulty redirecting several of my pages to a different domain, so far only one redirect works. These redirects don't work even after waiting more than 24 hours (if that is even necessary) and using multiple browsers on several devices, including Incognito mode in Chrome which should be equivalent to clearing browser cache. The one redirect that did work, was done about a month ago and worked almost immediately. Sorry for the problem with your re-directs. In order for us to assist you, we would need more specifics on what you've done or the domains involved. If you want to handle it privately, then please contact our live technical support team using the contact information at the bottom of the page. You would need to host the other domains in order for the redirects to be configured/work. If you subscribe to the Power or Pro plan you can host up to 6 or Unlimited domains for your redirects to work on each domain. If you are not subscribed to InMotion Hosting, you should contact your host to compare the available plans to know if you can host multiple domains on one account. I had followed the steps given in the video and Set up redirecting,it's been it is not working for me. Incase DNS zone needs to be changed or updated,Pls advise me witth relevant article or Video. Hello. Sorry to see that your redirect is not working properly. In order for the redirect to work the DNS (A Record) must point to the server that you are creating the redirect on. If it is not then the domain will never reach the server with the redirect you created and therefore will not redirect. It's also possible that the Content Management System (CMS) you are using to maintain your website may not accept those redirect rules and therefore you would need to configure redirects using the Documentation for the CMS you use to maintain the website. "Avoid landing page redirects for the following chain of redirected URLs. Sorry for "Avoid landing page redirects" issue. This normally happens because of issues with conflicts with SSL best practices. Check out this article for a really good breakdown on the issue. It should help you to determine what's happening. Can you help us? We're trying to reinstall Wordpress and it won't allow us to get to the proper page. 301 redirects are remembered by your browser. You will need to clear the cache in your browser or use a private/incognito window to ensure it is not seeing that old redirect. You should also check your .htaccess file to ensure the redirect is no longer present. I want to forward/ redirect my website to another hosted url but with MASKING. how to do that? Domain masking is prohibited. You will need to contact a developer for further assistance in masking your domain name to your visitors. Your example was two identical domains. Don't redirect like that, it would not work. 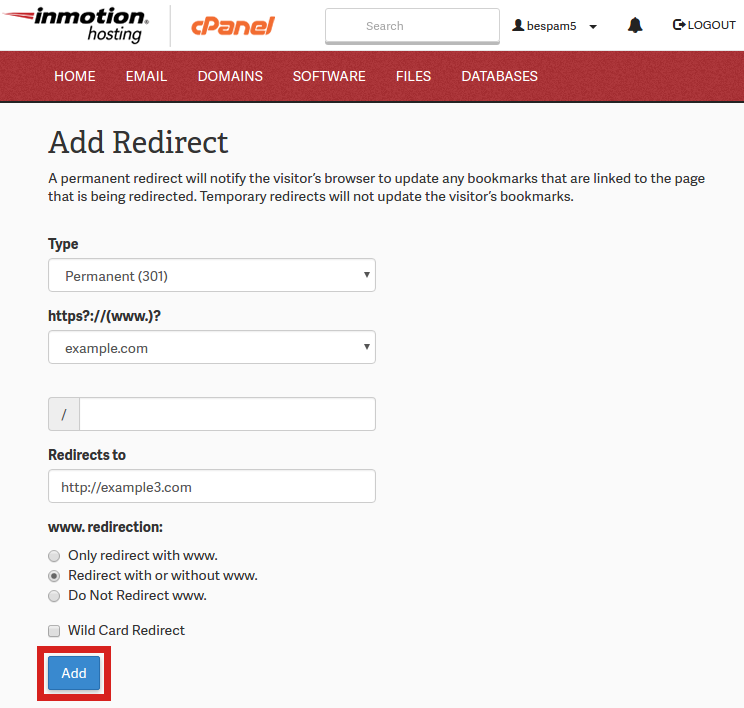 The instructions tell you how to use the interface in cPanel to create a redirect. 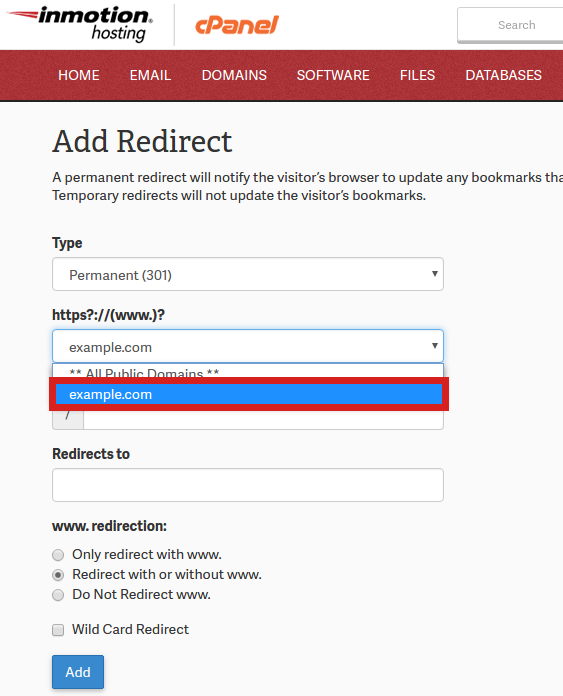 If you require specific cases of redirects such as redirecting all the links from domain A to domain B, then check out the instructions provided in Setting up a 301 permanent redirect. I'm sorry, cPanel does not have an option to add domains to manage in this manner. Creating an Alias domain and redirecting each link would be the only way to accomplish keeping both domains with the same content. Question: I have got an issue on google redirection when i search on google my domain it shows same on desktop such as domain.com/product but it seems something different in mobile wherein i insist to see such as m.domain.com/product after having redirected by anyone on google search engine. It does not matter that it looks same in desktop and mobile but after once clicked by anyone on their mobile it should see like m.domain.com/product on behalf of domain.com/product. Sorry for the confusion with the re-direct issue with your mobile site. I'm not 100$% what the issue is, but it seems that if someone is looking in Google and goes to your site from a mobile device, then it should convert to the mobile site. Your website should be able to determine the device that is requesting to view your site and convert the URL to the correct URL -be it for desktop or a mobile device. If it's not doing that, then you will need to consult with a developer/programmer or the appropriate support personnel (developer of your software) in order to correct the issue. email functionality still work as before the redirect? without being routed to YYY.org ? No, this should not affect your email functionality. How long does it take to redirect a domain to another? I redirected already but still no, does it take 24hours to redirect? I advise double-checking your DNS settings, to make sure that domain is pointing to the server where the redirect is happening. Once that is clear, you may want to clear your browser cache as well. Redirects only affect the website you're re-directing FROM. You have to look closely at the link that people are getting the 404 error. Remember that web servers receive a REQUEST for a specific URL. So, if you're on a website the URL brings you to that server. The redirect would act on that request and re-direct you to the new location. I hope that's clear. You would only make changes where you want to re-direct from. Thank you. Shows it is done. It appears it may take a while for the redirect ot go through. I will check to be sure it is working tomorrow. This redirect should be almost instantaneous. If it's not working, you can remove it and try it again. If that doesn't work you may want to reach out to the Support department for further assistance. Can I do this for subdomains also? Yes, it will work for subdomains. Lisa, .htaccess redirects won't affect how Google crawls your website. It will however redirect anyone that actually navigates to the page you have set up for the redirect. You will need to <a href="https://webmasters.googleblog.com/2015/12/indexing-https-pages-by-default.html">let Google know to only crawl your HTTPS site</a>. That's great to hear. We love feedback!